How to Use an Auto Parts Interchange Manual to Make Your Search for Parts Easier and Save Money. Interchange manuals can make life a lot simpler when you’re searching for parts for your car or truck. An interchange manual shows you parts from other makes and models that will fit your vehicle. This can make a restorer or mechanic’s life easier (1) because it expands the number of parts you can find if you’re looking for something rare, and (2) you might find that it’s cheaper to buy a part from another vehicle rather than your own. There’s no question that an interchange manual is useful, but using one for the first time takes a little training, but once you’ve got it down it’s easy. Hollander’s are the most popular brand of interchange manual, and many others work in the same way. Let’s use an example of a power brake booster for a 1968 AMX in the 1965-1979 Hollander manual. Next, cars are listed by corporation and brand in the front of the power brake booster section, so we locate AMC, then AMX, and then 1968, where we find there are two listings: one for disc brakes and one for drum brakes. We have disc brakes which has a number of 305 next to it. Immediately following this index is a list of parts grouped by number, so we need to locate 305. We turn to the 305 section and discover that you can use the power brake booster from 1968-1970 Ambassador, 1968-1974 AMX and Javelin, and also 1968-1970 Rebel, as long as they have disc brakes. Now, instead of searching for brake booster just among 1968 AMXs, you might be able to find one from an Ambassador, which could be more plentiful and cheaper. While Hollander’s is the best known interchange brand, it certainly isn’t the only game in town. 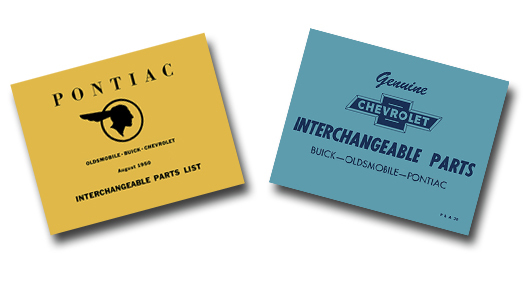 GM in the 1940s and 1950s made factory interchange manuals. Typically, those just list a factory part number, say for a Buick, and then list Chevrolet, Cadillac, Olds, Pontiac, or GMC part numbers that interchange with it. You’ll also find aftermarket interchange manuals that work similar to a Hollander’s, but are more tailored to specific car or truck models or even engine parts. For example, there are interchange manuals available for many muscle cars that are targeted to a specific brand or model, such as 1964-1972 Pontiac, 1973-1981 Firebird, 1968-1974 AMC, as well as many others. These typically have parts-finding tips (such as how to search for typical wear) as well as interchange information. 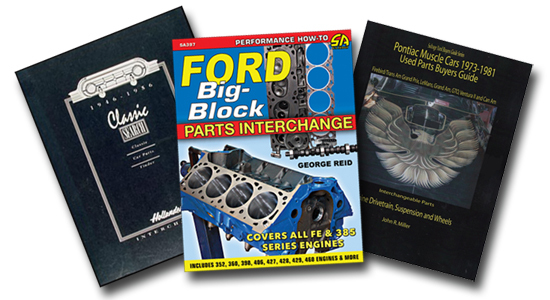 You can also find engine parts interchange manuals for your big or small block Ford and Chevy engines. Faxon Auto Literature carries interchange manuals on our website. You’ll find factory interchange, newly written restorer’s reference interchange books, as well as new prints of classic Hollander manuals. If you are looking for old Hollander’s or other years, give us a call to ask about our supply of used Hollander’s that is not yet online.